The Brewers have secured a much-needed power bat, as they've announced a three-year deal with third baseman Aramis Ramirez. The $36MM contract includes a mutual option for 2015. With first baseman Prince Fielder expected to leave via free agency and MVP Ryan Braun facing a potential 50-game suspension for a banned substance, the Brewers were motivated to add a middle-of-the-order hitter. Ramirez is represented by Paul Kinzer of Wasserman Media Group. 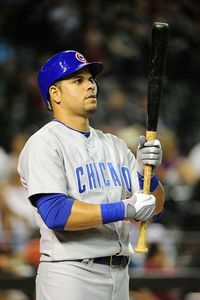 Ramirez, 33, bounced back to hit .306/.361/.510 with 26 home runs in 626 plate appearances for the Cubs in 2011. Former Cubs GM Jim Hendry stole Ramirez from the Pirates in a 2003 trade, and the right-handed slugger solidified the position for Chicago by hitting .294/.356/.531 with 239 home runs over eight-plus seasons. His defense is below-average, based on UZR. Aramis, MLBTR's eighth-ranked free agent, finished a five-year, $75MM deal when he declined his side of a mutual option in October. The Cubs will receive a supplemental draft pick for their loss. The Brewers had a need at the hot corner after Casey McGehee disappointed in 2011. The arbitration-eligible McGehee was traded to Pittsburgh shortly after the Ramirez agreement was reached. After Francisco Rodriguez accepted arbitration from the Brewers last week, it wasn't clear whether the Brewers would still be in the mix for another expensive player like Ramirez. The Brewers have revamped the left side of their infield, announcing a deal with shortstop Alex Gonzalez Monday. Bruce Levine of ESPNChicago first reported the agreement, with Ken Rosenthal adding details. Photo courtesy of Icon SMI. How Many Years Will Prince Fielder Get?